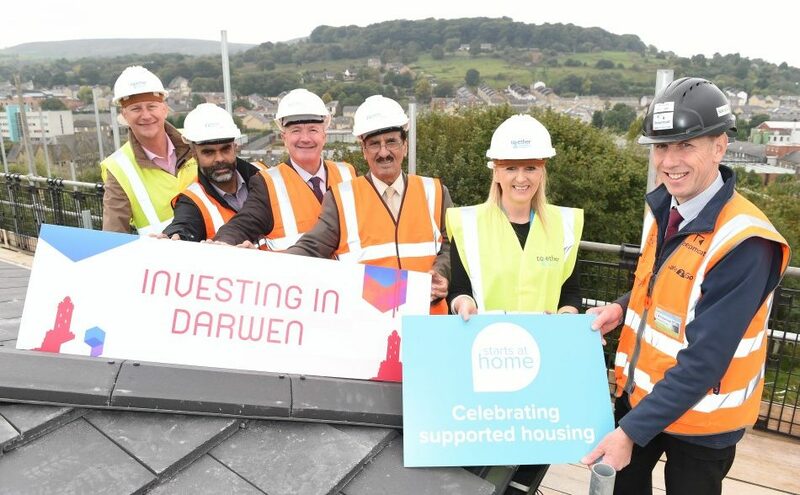 Representatives from Blackburn with Darwen Council, Together Housing Group and Keepmoat Regeneration, part of the ENGIE group, gathered to celebrate a milestone in the development of Riverside Heights housing with care scheme in Darwen. Construction of Riverside Heights is progressing at pace with tiling of the development’s roof nearly complete. Known in the building industry as a ‘topping out’ ceremony, the event marked the final phase of work on the highest point of the scheme. Opening in spring 2018, the £12million Riverside Heights housing with care scheme is for local people aged over 50 and comprises 85 self-contained apartments, with a range of additional facilities including a residents’ lounge, restaurant, hair and beauty salon and secluded gardens. These superb facilities will be open to the local community as well as residents. Housing with care provides high-quality accommodation with on-site care services tailored to individual needs. The aim of this safe and secure scheme is to enable older people to live independently for longer. I believe that this exciting development will meet the needs of older people across the Borough for years to come. I hope it will have a positive impact for the whole area, helping older people enjoy their lives in new, purpose built homes within the community. It is great to see such rapid progress and the scheme is looking fantastic, I want to give huge thanks to all partners who are working incredibly hard on this. These are going to be wonderful homes for people over 50 with some fantastic facilities, which will let people keep their independence and have control over their care, which we know is of great importance to people. I am looking forward to seeing the developments over the coming months. Together Housing are delighted to be celebrating another key stage in this development with our partners Blackburn with Darwen Borough Council and Keepmoat Regeneration. This special project means we will be able to offer a fantastic range of new homes for older people in Darwen as the development includes our housing with care scheme, Riverside Heights, and bungalows too on Shorey Bank Way. Meeting the housing needs of our ageing population is all about providing a range of great choices, tailored to different requirements. We are pleased to celebrate this key milestone with our partners Blackburn with Darwen Borough Council and Together Housing Group. This unique development addresses the increasing need for supported living in the UK. The scheme is designed with longevity and accessibility in mind to ensure that it adapts easily with people’s changing needs as they grow older. With the impending challenge of 100% more people over the age of 85 by 2030, at Keepmoat Regeneration, we are actively working with local authorities and our partners to improve the quality of life for people approaching retirement, and for those with specific needs. Riverside Heights housing with care scheme is open to local people aged over 50 with an assessed need for care and/or support. People interested in applying should contact The Housing Needs Team, Blackburn with Darwen Borough Council. Tel: 01254 585444. E-mail enquires: housingneeds@blackburn.gov.uk.